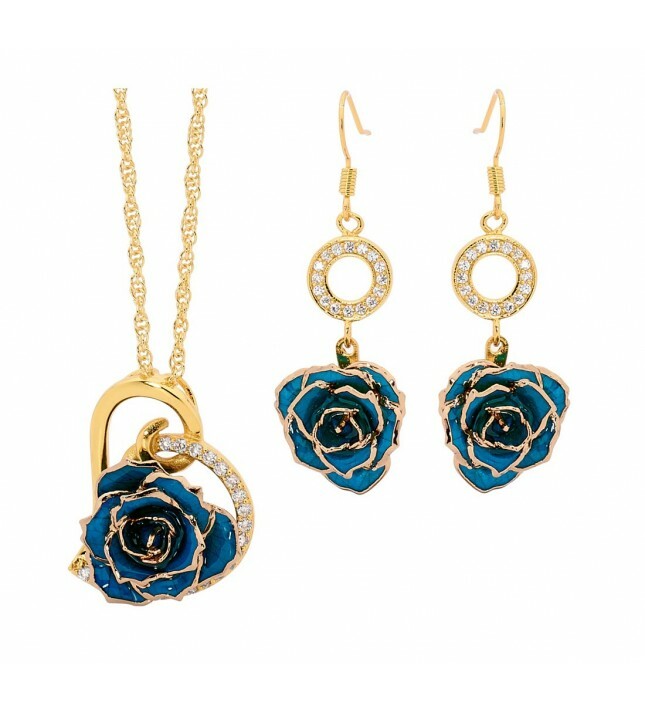 This delightful matching pendant and earring set features blue glazed natural rose petals and certified 24k gold. The pendant is heart-shaped with 21 synthetic diamonds inlaid. The earrings include 16 synthetic diamonds each. The set comes in a dark-blue velvet pouch with gold trimming and braided gold silk draw-strings. 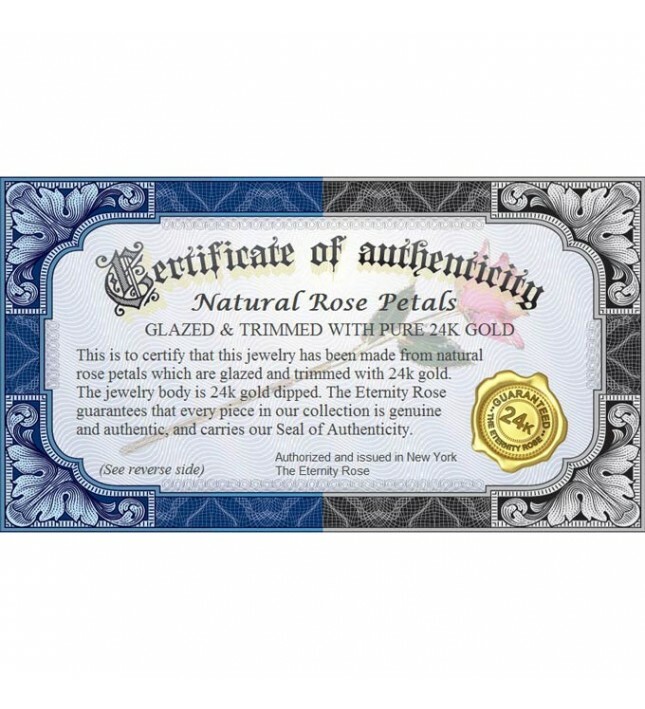 The jewelry comprises fine detail backed by a lifetime warranty, and includes a certificate of authenticity. Fast dispatch and express delivery are provided free of charge. 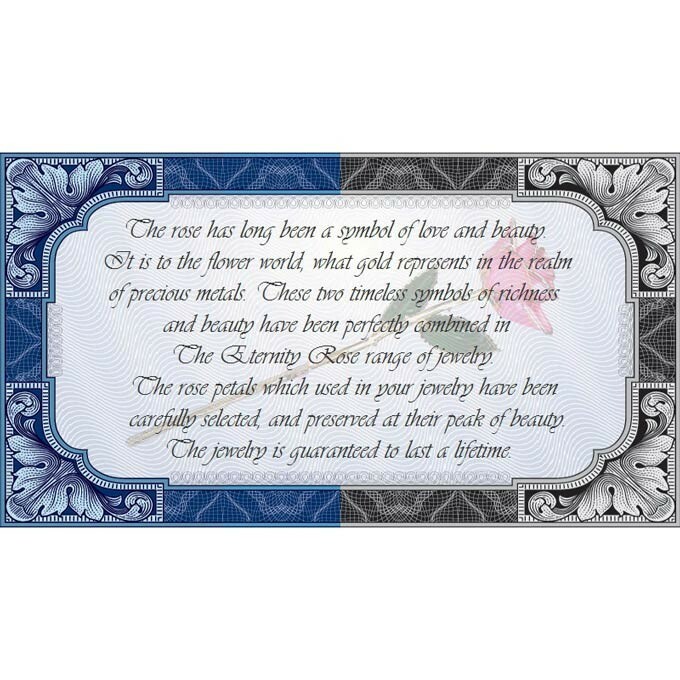 A SYMBOLIC HEART-SHAPED PENDANT made from natural rose petals which have been glazed and trimmed with 24 karat gold, and surrounded by 21 synthetic diamonds. The pendant includes a stylish multi-link gold-dipped chain. The miniature rose head on the pendant is approximately 3/4" in diameter. 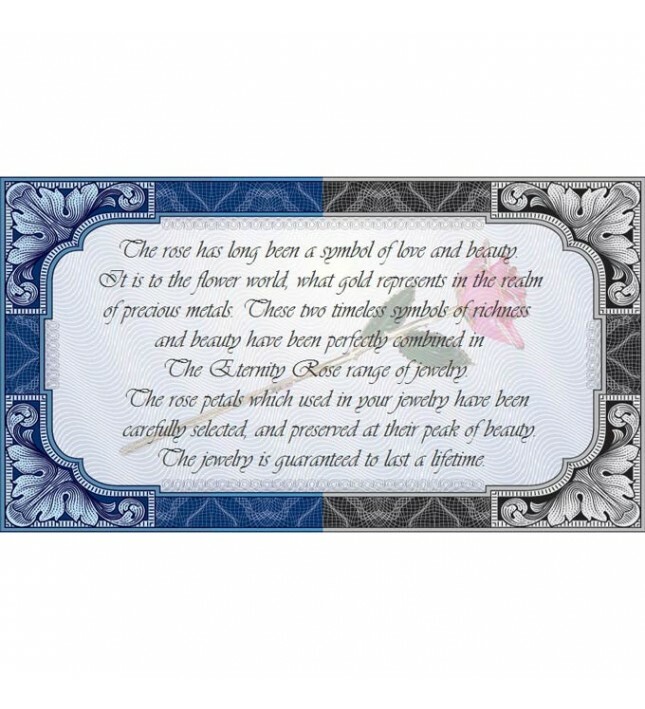 The pendant is 1.18" high and 0.91" wide, with the miniature rose head feature 3/4" wide. 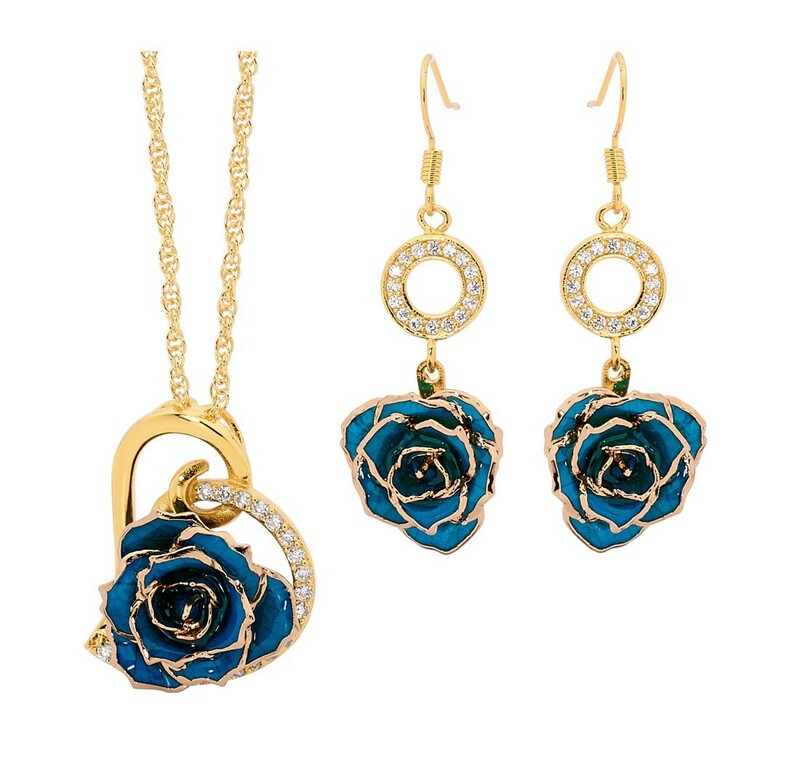 A PAIR OF FINE DROP EARRINGS made from natural blue miniature rose petals and 24 karat gold. Each earring length is 1 5/8” and includes a gold ringlet studded with 16 synthetic diamonds. The miniature rose heads are approximately 5/8” across. 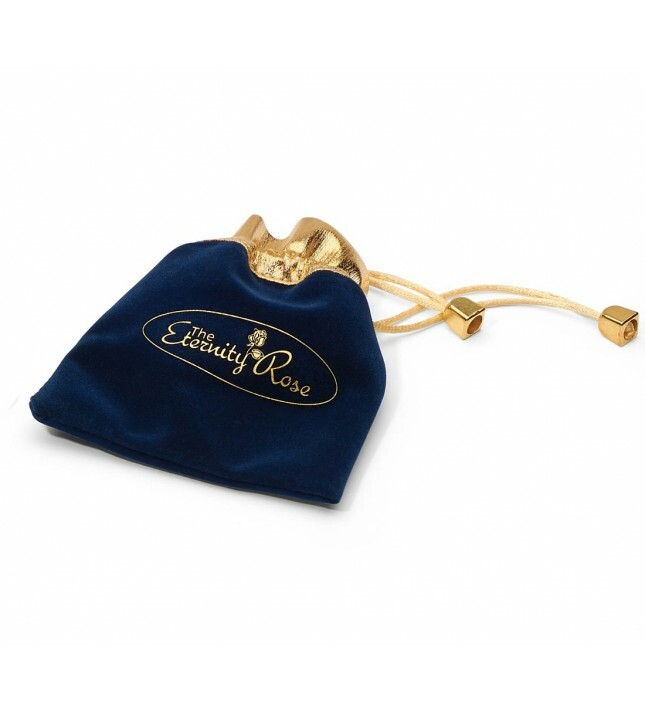 The set is perfectly presented in a jewelry pouch fashioned from navy-blue velvet and trimmed with gold braid draw-strings for safe storage. When you choose this gorgeous matching set, you can rest assured that each piece is unique and individually crafted by artists of the utmost skill in a process that takes three months from start to finish. Produced by hand to some of the highest standards in Europe, the award-winning design of this set is protected by a lifetime guarantee. 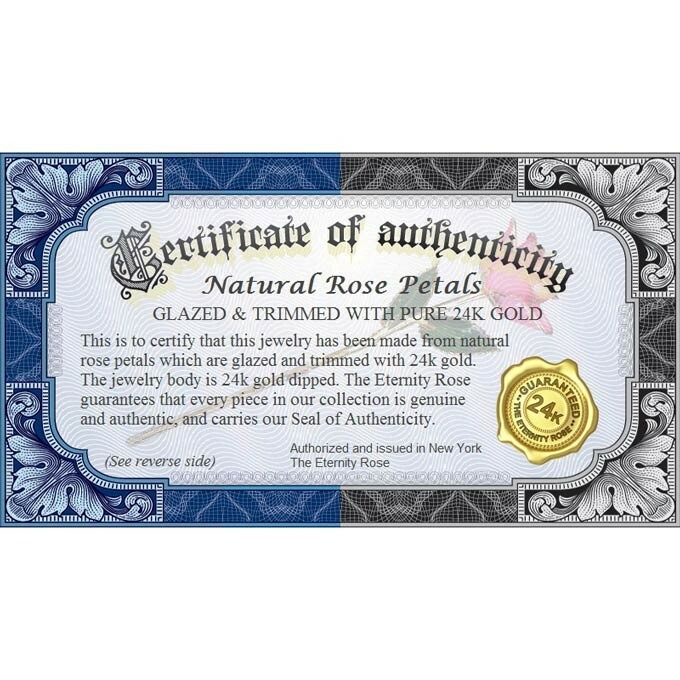 Rigorous quality control testing ensures that your item is received by you in perfect condition, and is an entirely flawless gift for a loved one who has an appreciation for the finest jewelry and the most beautiful of flowers, the rose.